Japanese Restaurant Minneapolis: Try Our Okonomiyaki! When people try Japanese cuisine for the first time, they often have many questions about what ingredients are used and what certain dishes contain. This is perfectly acceptable, as people are often unsure about a dish the first time they eat it. At moto-i, we believe in providing every customer with the perfect meal every time they visit, and we’re always happy to answer any questions about our entrees, drinks, and desserts. 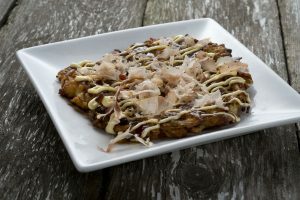 In this blog, we’ll look at one of the tastiest dishes on our menu – okonomiyaki! Okonomiyaki is a popular Japanese food that’s similar to a pancake, and is made with batter and cabbage. But unlike the pancakes of the West, where butter and syrup are often the only toppings, okonomiyaki can have a variety of toppings. 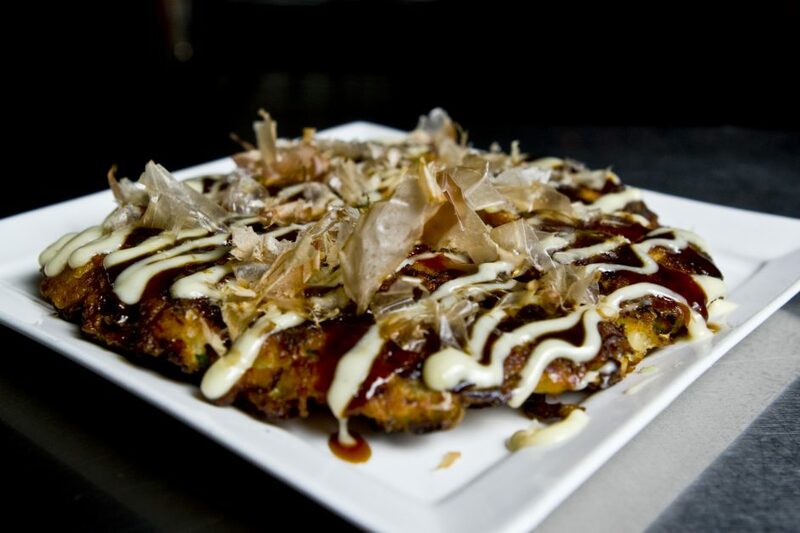 Our okonomiyaki is a bacon and cabbage pancake, and has katsu, QP mayo, and bonito on top. The word “okonomi” (the basis of the dish’s name) means “to one’s liking,” so if making one yourself, you can add whatever toppings you like! Okonomiyaki is popular throughout Japan, with the highest popularity in the west, including the cities of Hiroshima and Osaka. In some restaurants, patrons can actually cook their okonomiyaki themselves on the “teppan” or iron griddle in the middle of a the table! The wait staff brings the ingredients in a bowl, and the customer mixes everything at the table. The customer then cooks the pancake on the griddle, and once both sides are done, they add their toppings. For those who don’t want to cook their own okonomiyaki, most restaurants will prepare the dish in the kitchen. One of the main appeals of okonomiyaki is that it can be enjoyed for breakfast, lunch, or dinner. At Moto-i, we can add a poached egg for an extra boost of protein, and who doesn’t love eggs and pancakes for breakfast? With the combination of bacon, cabbage, and katsu, okonomiyaki is also a perfect choice for lunch or dinner. We’ve had people order it at 11:00am on a Saturday, as well as at 1:00am on a Thursday! At Moto-i, we’re always excited when someone wants to try a dish they’ve never had before. They may have been to a Japanese restaurant before, or maybe they haven’t, but if okonomiyaki is something they’ve heard of or that catches their eye, we’ll gladly make it for them. While we won’t make them prepare it themselves at their table, we’ll make sure it meets their desired specifications. We can also prepare it for vegetarian diets, and if you don’t care for fish, we can make it with the bonito. If you’re searching for the best Japanese restaurant in Minneapolis, come to moto-i today. We have an amazing selection of dishes, including okonomiyaki, ramen, and more. You can pop in for happy hour or grab some late dinner after a long day at work. Our private spaces are also available for parties and corporate events, so visit us in Lyn-Lake and reserve one today.